…finding comfort in our new-found daily routine. Within the past couple months, our days have settled into something quite manageable and, as a result, quite fantastic. I am now able to know just how much I am able to accomplish in the morning, during Eisley's typically two-hour nap, throughout the afternoon, and, finally, at night. I'm actually able to get so much more done throughout the day that I've decided to keep our evenings mostly free—allowing myself to focus on making dinner and then having a calm evening. I feel so…at ease lately. It feels good to look at the week ahead and not be so overwhelmed and worried about everything. …realizing my daughter is one smart cookie. We were at the park this morning, and there was an alphabet on one of the climbing toys. Eisley went up to it and started pointing out a bunch of the letters she recognized. "S, O, M, Q, E, G, I, T…" In January, when she had yet to even turn 17 months old, she caught me completely off guard by pointing out an "O" that was on a park bench. I pretty much wanted to grab the first person I saw walking by and shake them while screaming, "MY DAUGHTER IS A GENIUS! AND ALPHABET MAGNETS TOTALLY WORK!" It's just exciting to see how much she's learning on a daily, weekly, monthly basis. That's such an incredible (and rewarding) part of parenthood, you know? …reading Beyond Belief, which is a memoir about Scientology. Totally bizarre. The author, Jenna Miscavige Hill, is the same age as I am, and it's so crazy to look at the sort of life she's had as compared to my own. …a little bit obsessed with couponing. Not to the point of having to rent out a storage locker to fill with my stockpile, or to go dumpster diving for coupon inserts, but still. For lack of a better word, it just feels empowering to find so many fantastic deals on items I used to pay 3-4 times as much for. Right now I have is a year's supply of shampoo and conditioner, my favorite face wash, mascara, shave gel, razors, and lady products. Not only did I get these items for way below retail, but now I won't even have to think about buying any for the rest of the year. Crazypants. And don't even get me started on my grocery bill! I'm totally sold on couponing. Look for me on TLC. …surprised we actually took the leap and decided to ditch DirecTV. (Aside from locals, we really only seemed to watch Food Network, anyway. I mean, really.) We bought this antenna, which even allows us to get some HD channels. The reception isn't always 100% perfect, but it'll do for the amount of TV we actually watch on a daily basis. And we still have Netflix to stream through our Wii, which is where Eisley can get her fill of Barney, Sesame Street and Caillou. We just saved ourselves $600 a year. Can I get a slow clap? …quite giddy about some upcoming visits from my family. …in love with all things coral and poppy. I can't wait for the day that I'm a momma and can experience little moments like that. The daughter of a friend of mine has started saying "3,4,5" before she does something (ie jumps, goes under water, etc) instead of 1,2,3. Kids are seriously so funny sometimes! Girl. I am totally adding that book to my to-read list. I am creepily obsessed with memoirs like that. Have you read Escape by Carolyn Jessop? You might enjoy that one too. Also, you're my couponing hero. I need to find some time to investigate your strategies. HipFriends.com™ The Women's Network! - JOIN The Hippest, Coolest, Social Network and blog for Women to Social Network, Meet New Friends ONLINE and OFFLINE in your local area! I seriously need to get more into couponing. I love ECoupons but I feel like I'm just overspending all the time, time to change that! 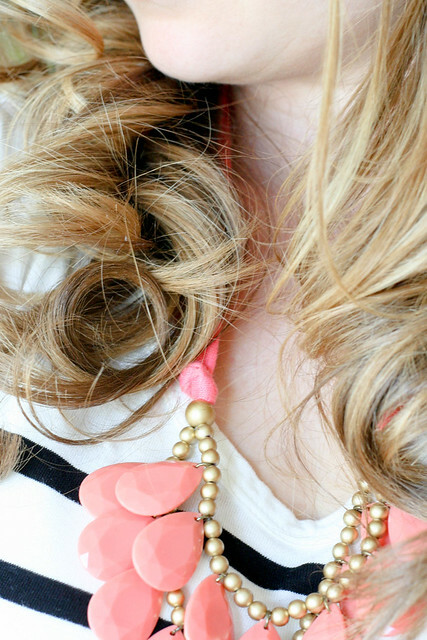 Also, love your hair and that necklace, both are so fabulous! I, also, have not worn shorts in forever. I never liked my knees growing up, and so the habit of not wearing shorts kinda always stuck with me. Also, poppy is a color? Really? I read 'Beyond Belief' as well, and the author, Jenna Hill, lived a crazy life for sure. It was a very interesting read though. Awesome that Eisley is learning so many letters! That's exciting, and way deserving of being excited about. And that's also awesome about ditching direct tv. I really want to do that in the future, but for right now, I have cable. But I'm glad that's working out for you guys. I think you've convinced me to try couponing thing. oddly enough I watched both season of Extreme Couponers on Netflix and just wasn't feelin buying 37 mustards. But I can get behind mascara and shampoo at a discount! Such a great feeling, seeing the grocery bill total plummet (or even drop a few cents) with coupons, gives me a little thrill every time! I'm looking forward to having the energy/time to do my hair, mussy bun has been happening over here WAY too often! I'm right there with you with the shorts, I'm a capri kind of girl! We ditched DirectTv last year. SOOOO happy without it. We stream Netflix and Hulu plus via the Wii and get almost everything we want. Dan listens to his baseball games on the radio. It's kind of "old fashioned" and he absolutely loves it. And I never like shorts either. You'll find me in skirts (longer ones to my knees) and capri pants, sometimes a dress. The inseams on shorts...blow my mind. TOO DANG SHORT.